Heat all ingredients in a cooking pot over a medium heat and bring to a boil. Reduce heat, cover the cooking pot with a lid and simmer the broth for about 6 hours. Make cross-hatch cuts on the barramundi fillet, skin-side. Marinate barramundi fillet with ginger and shallots, Sichuan peppercorns, salt and Chinese rice wine. Set aside. 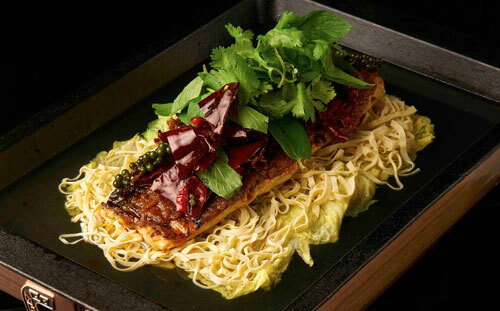 Place the leek onto a baking pan and top with the marinated barramundi fillet. Grill in a pre-heated oven at 280ºC for about 4 minutes, then flip the barramundi and bake for about 4 minutes. 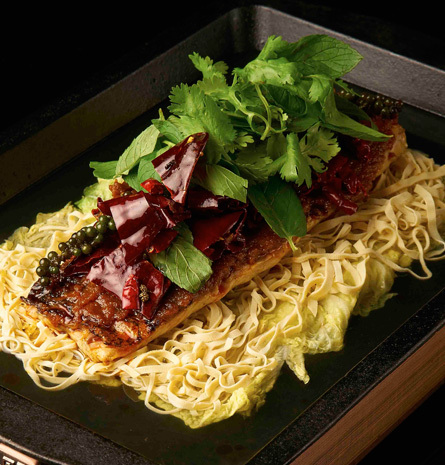 Place the blanched white cabbage and blanched beancurd skins onto a serving dish and top with the grilled barramundi fillet and cooked dried chillies. Ladle the cooled Sichuan mala broth over the fish and garnish with parsley and chilli slices.